Directors and staff at a North Yorkshire horticulture research facility are celebrating after winning a prestigious award. 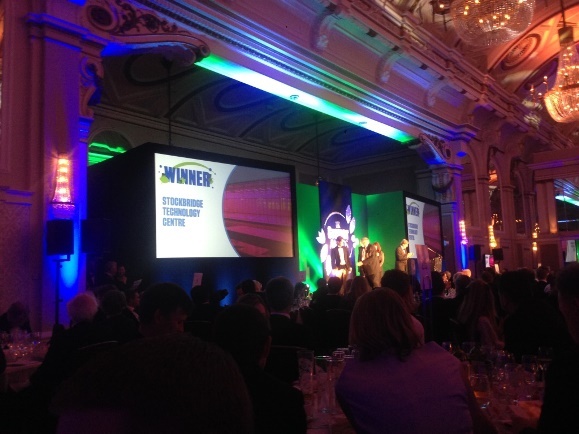 The team at Selby based Stockbridge Technology Centre were awarded the David Piccaver Science Award at the UK Grower of the Year awards at a gala dinner at the Grand Connaught Rooms in London. A special award for 2015, the David Piccaver Science Award recgonises the organisation that has brought innovation through research into profitable practice within the growing community. Dr Martin McPherson and Dr Phillip Davies received the award from David Piccaver’s daughter, Lizzie Lilley. Dr McPherson said: “David Piccaver was a giant in the horticultural industry and his contribution and passion is sadly missed. David was a Director of Stockbridge and gave us the encouragement and confidence to go ahead with this groundbreaking technology. Organised by Horticulture Week magazine, The UK Grower Awards 2015 celebrate the very best in the UK production horticulture industry. The dinner was attended by over 400 people who enjoyed a three course meal and after dinner entertainment. The award comes at an exciting time for Stockbridge Technology Centre as its pioneering trial on LED lighting to grow crops has created much industry and media interest. Stockbridge Technology Centre is an independent, not for profit organisation that is wholly owned by the UK horticultural industry and is a centre of excellence in technology transfer to agriculture and horticulture. It leads the way in research into LED lighting and the new facility for tall crops such as tomatoes complements an existing facility looking at benches or layers of crops that could be a model for urban farms of the future.